I have never really liked red bean soup; neither do I like green bean soup. Perhaps, it was having to drink these sweet soups almost every other day when I was young that makes me want to hide from them when I grew up. It could also be an inherent dislike for soupy dishes that makes bean soups the least of my favourite at the wedding table. So why am I still making red bean soup? I bought a packet of red beans in September last year to make mooncake piglet cookies and left a whole 99% of the packet untouched in the kitchen cabinet. These red beans were screaming at me everyday to fish them out and do something about them. Given that red bean soups aren’t very difficult to make (that was why my mum always made them when I was young – it helped to fill our greedy tummies very quickly), I decided to make red bean soup – with some added flavours and ingredients – this being a good way to fill up our tummies very quickly on a lazy Saturday afternoon. Bring 6 cups water to a boil in a small pot. Add red beans, pandan leaf and lotus nuts to water. Leave to simmer for 1.5 hrs. Bring 3 cups water to a boil in a separate pot (1 hr into the cooking). Add sago seeds into pot. Cook uncovered for 10 min, stirring continuously. Cover pot with lid. Remove from heat and leave for another 10 min till they turn translucent. Rinse sago seeds with cold water and set aside. Add rock sugar, sago seeds and rice balls into red bean soup. Simmer for another 5 min till rice balls float up (i.e. are cooked). Remove pandan leaves. Drizzle with coconut milk to serve. This sweet soup can either be served hot (during winter) or cold as a dessert (during summer). Honestly, except for the red beans, pandan leaf, water and rock sugar, the rest of the ingredients are optional. This sweet soup can be prepared really easily and without any fuss at all. 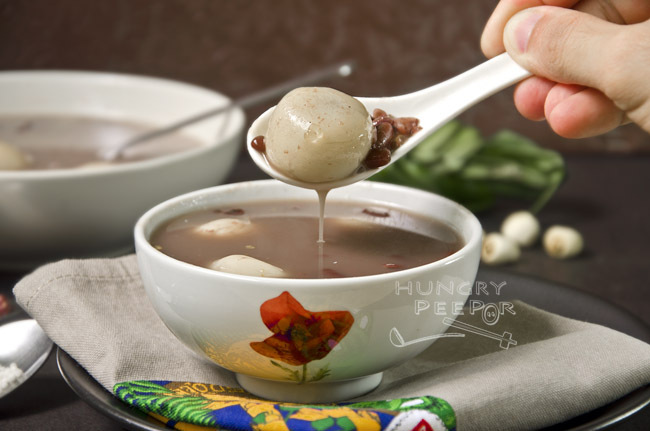 The Japanese version of sweet red bean soup uses Azuki red beans which produce a thicker soup base; the Cantonese version uses additional ingredients such as orange peel to give it a tangy flavour. This version follows the local breed that can be found in most food and hawker centers in Singapore. 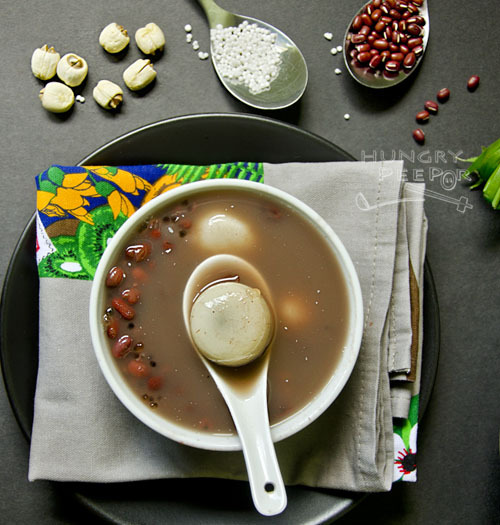 This entry was posted in Chinese, Soup and tagged Dessert, Red Bean. Bookmark the permalink.